Days after the surprise announcement that all campuses of Vatterott Educational Centers would be closing around the country, a popular instructor at the campus in KCMO now finds himself without a job and without health insurance as he battles cancer. KANSAS CITY, Mo. 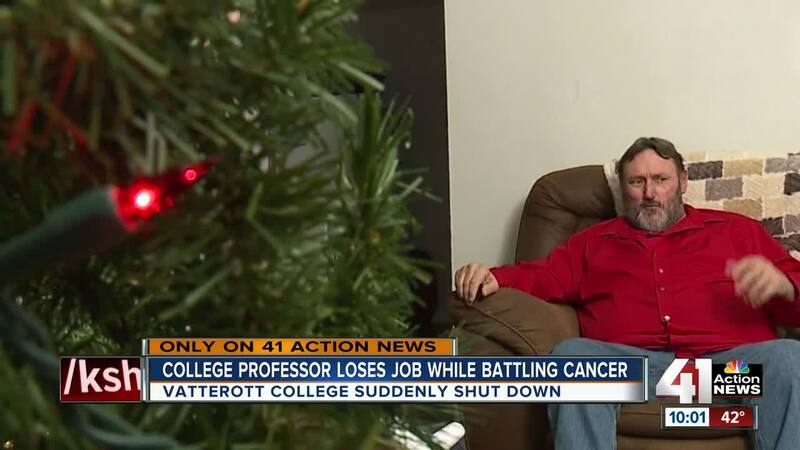 — Days after the surprise announcement that all campuses of Vatterott Educational Centers would be closing around the country, a popular instructor at the campus in KCMO now finds himself without a job and without health insurance as he battles cancer. Corky Goodpasture started as an automotives instructor at the school four and half years ago and later became the program director. For him, being an instructor was more than a job. As a popular instructor at Vatterott, Goodpasture helped the students navigate through the world of automotive mechanics: from steering and suspension to HVAC and suspension work. The popular instructor told 41 Action News the job brought plenty of fulfillment to him, especially after he was diagnosed with cancer two years ago. Despite dealing with chemotherapy treatment, Goodpasture continued to teach students the ins and outs of automotives. However, this week brought shocking news for the Vatterott community. With multiple campuses around the country, Vatterott announced closures as a result of financial shortcomings. In a letter sent to the school community, Vatterott put the blame on an inability to close a deal with a buyer due to what the college said was an increase in restrictions imposed by the U.S. Department of Education. The Missouri Department of Higher Education has since posted resources to help out students impacted by the closure. However, staff members like Goodpasture are now left searching for job openings. Aside from searching for a new job, Goodpasture will also search around for a health insurance option. The instructor will be eligible for health insurance under Cobra for the next 18 months and will likely be eligible for coverage under the Affordable Care Act with the school closure possibly serving as a qualifying event. Moving forward though, Goodpasture told 41 Action News that he wants to be in the classroom again.